A while back we posted an article regarding the small Tintin promotional animation film Bob De Moor worked on for the Société Générale in 1969. Bob De Moor drew the decors in pencil while Claude Lambert would color them. Bob De Moor and Claude Lambert would also work on another movie, the “Tintin et le temple du soleil” (English: “Tintin and the Temple of the Sun”) also released in 1969. 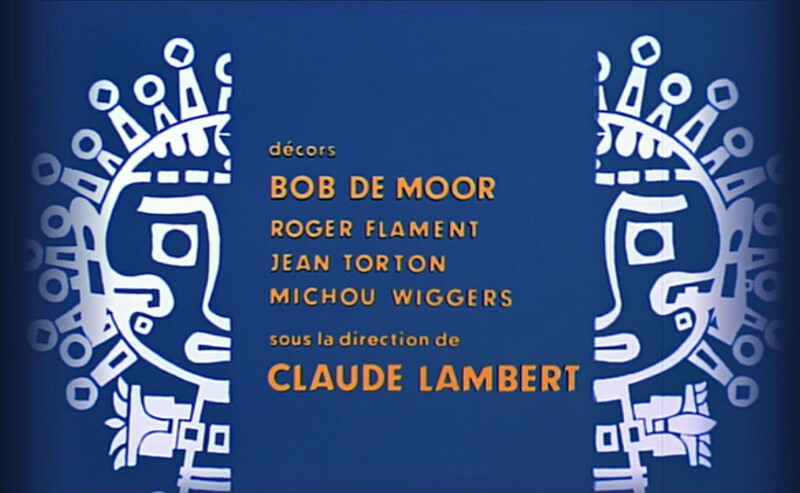 Lambert would be supervising that part as can also seen in the opening credits for the animation film. Other people who worked on the decors included Roger Flament, Jean Torton and Michou Wiggers. 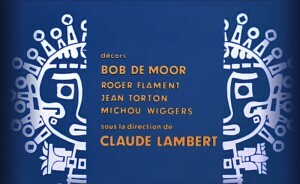 Bob De Moor is mentioned in the opening credits for the animation film. Note that a remastered version is available on Amazon . Bob De Moor‘s work would not be limited to just drawing the decors of the film in pencil. An album was also released via Casterman holding scenes from the film and it was Bob De Moor who took care of adding Tintin and co on the decors (a bit like what happened with “Tintin and the Lake of Sharks”). But more on that later on when we take a closer look at this album which never saw a reprint and is not always easy to find (in case you are still searching for a copy). 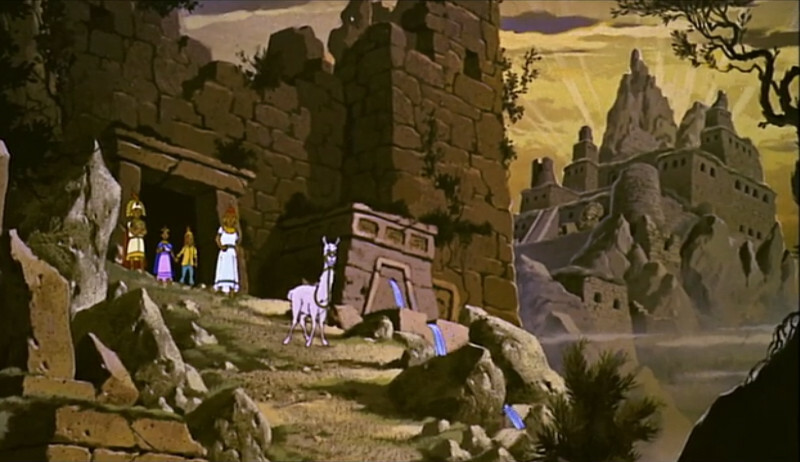 If you look back at it, you’ll see that the animation in this film looks outdated, but nevertheless it must be said that there are some really well-worked out decors throughout the film. One of the decors Bob De Moor worked on. 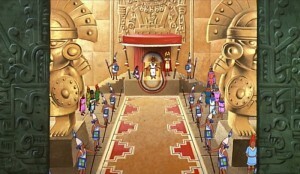 For Belvision it would be their 5th long animation film. The year before they had launched “Astérix & Cleopatra” which was a real success, not in the least because this time it was co-realized by René Goscinny and Albert Uderzo unlike the 1967 film “Asterix the Gaule”. Another example of a decor Bob De Moor worked on. The “Tintin et le temple du soleil” film was a co-production between Belgium, France and Switzerland and merged the Tintin albums “The Seven Crystal Balls” and “Prisoners of the Sun”. Although there had been a first long animation film of Tintin before (“The Calculus Affair” by Ray Goossens in 1964 which was totally based on the TV-series Belvision had produced), “Tintin et le temple du soleil” is considered to be the very first real long Tintin animation film intended for cinema use. Based on a scenario by Greg, many scenes from the 2 books were deleted and events were changed and some were added. 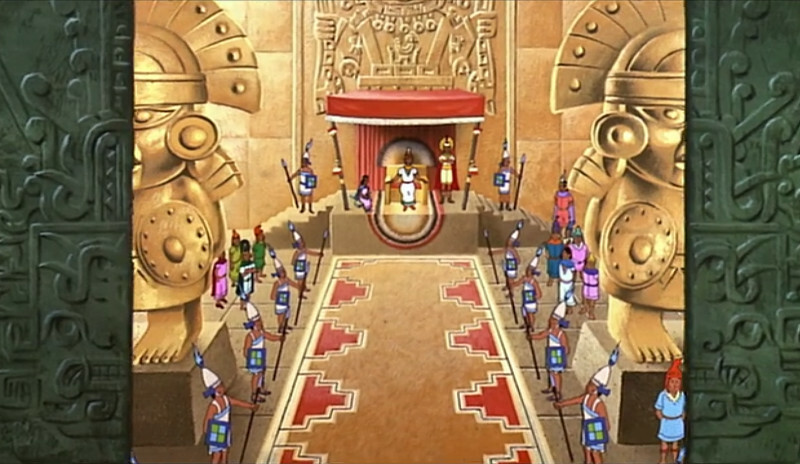 The first book was condensed into the first 15 minutes of the film and their was the extra role for the Great Inca’s daughter next to Zorrino. You’ll also notice that Thomson and Thompson accompany Tintin and Captain Haddock in the film on their quest to rescue Calculus. In the book they keep on looking for Tintin and his friends, even on the South Pole.